If you are doing multiplayer game and you want to share the stats with other players you should keep them in PlayerState. Shooter Tutorial isn’t multiplayer game so I will keep the data in Actor Component attached to GameState. Why in GameState and not in GameplayCharacter? Because combo level and score were implemented there. They both (stats, combo and score) should be at PlayerState if you want to go with Unreal Architecture. That was my mistake and during refactoring I will move them to PlayerState. Let’s start by creating component which have all stats and will manage them. BulletsMiss int Storing information about how many bullets player miss enemies. 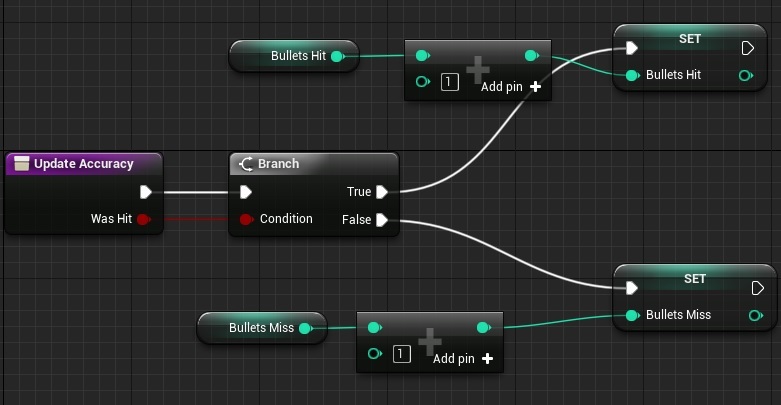 BulletsHit int The same but for bullets that hit enemies. And now let’s add some functions. And that’s all here. Why I’m doing stats in separate component? As I would be easier to add more stats later. Don’t try to put everything in GameState/Character/etc – use UE4 features to make your blueprints more object oriented and component based. Now go to your GameplayGameState and just add StatComponent in Components View. In BP_BaseEnemy we had created couple of months ago there is a function named CalculatePoints. It’s checking if there was enemy hit or not. We will use that function to update stat component. I have marked added nodes. Go to BP_BaseEnemy and open Die function. Just increase enemies killed in our stat component at the end of this function. Open GameplayGameState and find IncreaseComboBar function. Find place where CurrentComboLevel int is increased.